In light of recent tragedy and political turmoil around the world, we need music now more than ever—not as a distraction or an escape, but as a gateway toward experiencing our shared humanity. We need music to open our hearts, our ears, and our minds. We need music to connect us in ways which transcend language, religion, tradition, and geography. That’s the idea behind Yo-Yo Ma’s Silk Road Ensemble, a global music collective comprised of performers and composers from over 20 countries throughout Asia, Europe, and North America. With such an array of distinct cultures and musical voices present in their collective, the music of the Silk Road Ensemble is at once contemporary and ancient, familiar and foreign, traditional and innovative. The group makes culturally conscious music, drawing upon instruments, ideas, and traditions from around the world to create music that is reflective of our 21st century global society. Their new album Sing Me Home is a musical culmination of this ethos. Silk Road members each selected a musical work of personal significance to them, then invited guest musicians from different cultural and musical backgrounds to collaborate with the ensemble on each piece. The result is an album which travels fearlessly from the folk melodies of Macedonia to the traditional textiles of Mali, from the fiddle ditties of Ireland to the harvest songs of Galicia, and from the taiko tunes of Japan to the sitar suites of India. Released as a companion album to the documentary film The Music of Strangers: Yo-Yo Ma and the Silk Road Ensemble, the album stands confidently on its own as a glimpse into the music and personal memories that most inspire the individual artists of the ensemble. The journey begins with Chinese pipa player and composer Wu Man’s piece “Green (Vincent’s Tune).” Eastern folk melodies come alive through an orchestra of Chinese wind instruments, Western strings, Kamancheh (an Iranian bowed string instrument), assorted percussion, and, of course, the visceral Tuvan throat singing of the Grammy-winning vocal octet Roomful of Teeth. Violinist and composer Colin Jacobsen’s contributions to the album include two imaginative arrangements of Western folk tunes: the Irish “O’Neill’s Cavalry March,” featuring Martin Hayes on the fiddle, and the American “Little Birdie,” featuring vocals by Sarah Jarosz. Each arrangement expands the timbral and harmonic palette of Western folk music by incorporating Eastern instruments like the pipa (a four-string Chinese string instrument), the shakuhachi (a Japanese bamboo flute), and the sheng (a Chinese free reed instrument). What follows is a new arrangement of the traditional Malian tune “Ichichila,” for which the ensemble enlists the talents of Toumani Diabaté on kora (a West African string instrument) and Balla Kouyaté on balafon (an African wooden xylophone). Traditionally sung by the Taureg people while dyeing textiles in indigo pits, the song’s colorful, upbeat cadence comes from the rhythm of the textiles being plunged in and out of the dye with long sticks. Balkan vocalists Black Sea Hotel lend their voices to an arrangement of the traditional Macedonian folk song “Sadila Jana,” while Japanese percussion instruments take center stage in a contemporary arrangement of the Japanese “Shingashi Song.” Indian raga is the inspiration for the organic and free-flowing “Madhoushi,” featuring Shujaat Khan on sitar and vocals, and “Wedding” features a vibrant marriage of clarinet, oud (a Middle Eastern string instrument), and wordless vocals in a heartfelt tribute to the millions of Syrians who have fled to find new homes in recent years. But perhaps no other song captures the spirit of the album more than “Going Home,” a piece that has passed through countless composers’ capable hands in the past century. Originally composed as part of Dvořák’s New World Symphony, it was later arranged as a song with lyrics by his pupil William Arms Fisher. On this album, we find it rearranged and translated into Chinese in a twinkling string rendition featuring vocals by Abigail Washburn. Jumping from China to Spain, the work is followed by a Galician harvest chant. Davide Salvado lends his voice for a new arrangement of a traditional Galician work song titled “Cabaliño,” his voice slow and steady above a bed of lively strings and warbling accordion. Rhiannon Giddens’ gypsy jazz-infused vocals sparkle atop a tangle of accordion, Klezmer clarinet, and yangqin (a Chinese hammered dulcimer) in an arrangement of the “St. James Infirmary Blues,” while Bill Frisell’s soulful guitar solos shine in “If You Shall Return…,” a Kojiro Umezaki original which takes its inspiration from Bhatiali boat songs. The album comes to a close with Rob Mathes’s arrangement of the jazz standard “Heart and Soul,” featuring vocalists Lisa Fischer and Gregory Porter. The song plays like a smile: it’s got all the waltz and charm of 1930s New York jazz, but with more global instrumentation. Because in the end, that’s what the album is really about: bringing together an entire world of sound, listening to one another with open hearts and open minds, and ultimately, creating harmony and understanding in a world that is too often divided. 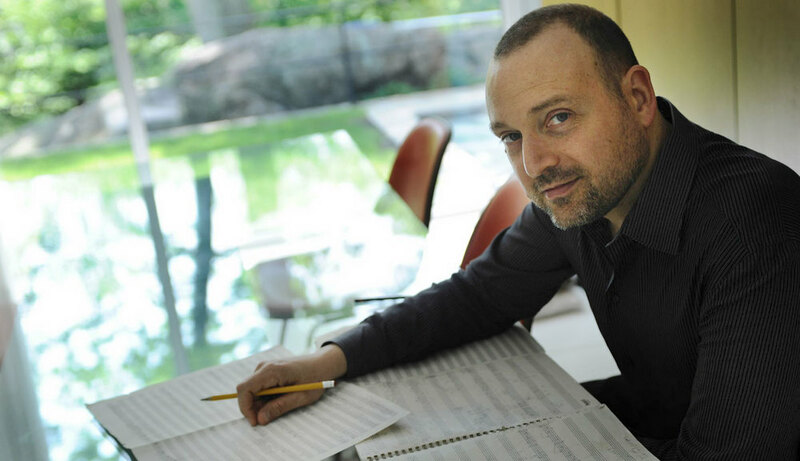 In anticipation of Seattle Symphony’s first Sonic Evolution series concert, “Under the Influence Of Jazz,” we had a chance to talk to Derek Bermel about his piece, “Migration Series,” which will be part of a star-studded program. The concert is tonight, Thursday, October 29 at 7:30pm at Benaroya Hall. Be sure to stop by the KING FM/Second Inversion table and grab some swag! Second Inversion: Do you think the fusion of genres in Seattle Symphony’s Sonic Evolution series is a good strategy to expand and diversify the audience? Derek Bermel: Absolutely. I think when you can give audiences a hook to come see something they’re familiar with and then you hit them with something they’re not so familiar with, it’s a gentle way of exposing way them to music they might not know about. I think it’s truly a groundbreaking series – I’ve been following what Seattle Symphony’s been doing for the last four or five years. Ludovic Morlot and Simon Woods are looking at music and art holistically as it effects peoples’ lives and they’re looking at what’s going on locally and trying to build in pathways for people who are not normally familiar with symphonic music to get into the vibe. SI: The title of tonight’s show is “Under the Influence of Jazz.” How has jazz influenced your composition style as a whole? DB: I grew up listening to and playing a lot of jazz, so there was a lot of influence right from the start. I was and still am a huge fan of Thelonious Monk and I remember walking into the record store as a kid and seeing a bright red record in the bargain bin and spending my allowance on it. That record, “It’s Monk’s Time,” really blew my mind and changed my life. It coincided with the time in my life when my grandma bought me a small, “honky tonk” piano and I immediately started imitating Monk’s playing on this piano. It really worked on this piano because it had some keys that didn’t go down all the way and it went out of tune quickly, but I really got that stride and feel by imitating Thelonious Monk. I also played clarinet and saxophone in the jazz band and was listening to a lot of Bill Evans, Charlie Parker, Coleman Hawkins, Duke Ellington. SI: And how about the visual artistic influence of Jacob Lawrence? Tell us about your experience with his set of paintings “The Migration Series,” and how it influenced this composition. DB: I first encountered the paintings when I was young, going into the city (New York) with my mom and saw the exhibit. There was something about them that struck me in such a deep way. I think it was my connection to African American music and my friends and I saw something in the paintings that felt like music and felt like dance. They jump off the page and they’re very evocative of gesture, shapes, colors, and movement. I was very drawn to these pictures and they stayed in my mind for many years. When I started to write this piece, there was something about the form and the way I was writing that had kind of a mosaic quality. I wanted musical themes, approaches, and rhythms to come back during the piece, and for the piece to ebb and flow with this mosaic quality. I’ve been lucky enough that the Seattle Symphony and Maestro Morlot are interested in having the images displayed along with the show. It’s an idea that’s been brought up before, but this time it’s actually going to happen! I’m very excited see how the piece will play with the images. For me, the thrill is to introduce more people to this artwork as well. It feels very powerful as an artist to be able to make a tribute to another artist that you admire so much and to let people know about it. A lot of people have gotten to know Jacob Lawrence’s work through my piece, so that’s very gratifying for me as an artist. And for a taste of the piece and Derek’s insights about the structure of the piece, take a listen! Since the birth of Second Inversion, Brooklyn Rider‘s versatile recordings of new music for string quartet have been a significant presence on our airwaves. Eric, Nick, Johnny, and Colin also captured our hearts with a great Vine video musically depicting and celebrating “Second Inversion,” back in February 2014. To celebrate ten years together as a quartet, they created The Brooklyn Rider Almanac. This is a collection of thirteen new compositions for string quartet mostly by composers rooted in jazz, rock, or folk music. It’s an incredible celebration of Brooklyn Rider’s musical connections in the last decade (the composers are self-proclaimed “musical crushes” and old friends) and for posterity, an expansion of the string quartet repertoire. Furthermore, the project is “about inspiration, about music being the tip of a bigger iceberg,” according to Colin Jacobsen. My personal favorite track on the record is Colin Jacobsen’s “Exit,” featuring the versatile vocalist Shara Worden. With a light texture of percussive hand claps, plucking pizzicati, and pointed vocal sounds, there’s an undertone of minimalism in this piece in a beautifully “less is more,” simplistic way. Colin Jacobsen cites three sources of inspiration of this piece. First is Shara Worden and her dichotomy of not giving any excess in what she sings, yet still diving head first and inhabiting the role of whatever she’s singing. Second is Kandinsky, who happens to be the lyricist of the song – “Exit” comes from a book poems and woodcut etchings called Sounds, written at a time when he was going toward abstract painting and trying to get away from the literal meaning of words. Thirdly, Jacobsen draws from David Byrnes’ How Music Works by finding just the groove that is necessary for the piece to happen and not putting anything else there. In regard to each individual piece and the collection as a whole, it’s best for me to keep it simple and just say this music is GOOD. The type of “hand it to my friends who have little or no interest in classical music and say, ‘stop what you’re doing and LISTEN TO THIS NOW! '” good. It rethinks classical music AND the string quartet with a timeless quality, putting a stamp on the fact that music doesn’t need labels or categories or genres. Put these four (or five, in “Exit”) musicians together who can not only play music well, but express emotion and breathe life into the notes on a page, and the magic is there. Get your own copy on Amazon or iTunes (it comes with 2 bonus tracks if you purchase on iTunes!) of the Brooklyn Rider Almanac and keep an eye on their tour schedule for a performance near you!